The United Kingdom's domestic counter-intelligence and security agency, most commonly known as MI5, was founded in 1909 by Sir Vernon Kell KBE. 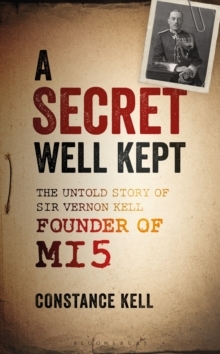 Kell (`K' within the agency) not only founded MI5 but was also its Director for 31 years, the longest tenure of any head of a British government department during the twentieth century. Kell was also fluent in six foreign languages, making him arguably the most gifted linguist ever to head a Western intelligence agency. A Secret Well Kept was written by Kell's wife, Constance, in the 1950s, and the manuscript has been a treasured family possession ever since. Constance's story is endlessly fascinating: she tells of their life in China during the Boxer Rebellion, the formation of MI5 in 1909, the key characters, events and spy cases of Kell's career, and his important work achieved for the country during two world wars. A modern-day preface from Kell's great-granddaughter, introduction by Stewart Binns and notes from Dr Chris Northcott add historical context to this delightful and unparalleled insight into the personal life of an extremely powerful and important man.